Outdoor Storage Has Never Been So Practical…Or So Affordable! If easy access, cost efficiency and a large storage area are what you need, Job Hut is the answer. 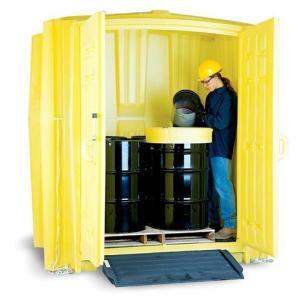 An extra large storage area lets you store up to eight 55-gallon drums right on their pallets! Its low profile design allows for easy access. And it’s forkliftable from all sides for effortless handling. Tough polyethylene construction means it won’t rust or corrode while UV inhibitors make it extra durable for outdoor use. 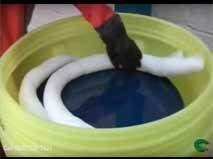 A large 75-gallon sump capacity eliminates the risk of spills or leaks. Structural foam grates also remove for easy cleaning. What’s more, molded-in vents reduce fumes and condensation inside, while heavy-duty hinges and lock keep contents secure. The Job Hut offers substantial savings when compared to similar metal or concrete storage buildings, while providing superior performance. 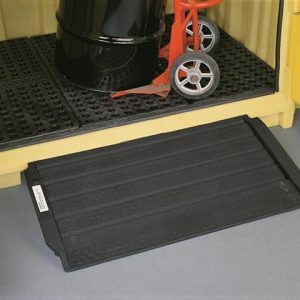 The optional ramp facilitates loading your drums into the unit. Safe, secure, and cost-effective.